All the Australian film distributors throughout the 1940's through to the 1970's printed duotone daybills for a great many of their films for whatever reason. I have been researching this type of daybill for many years but what has remained in my mind is that RKO were very scant in printing duotone daybills up until they ceased operating in the late 1950s. Up until I joined VMPFI was only aware of one duotone RKO daybill and this being Cry Danger. Ves posted a duotone Marchant Joan Of Paris and David posted a The Fallen Sparrow today. This now makes three I am aware of. Does anyone have any other examples they can post on this thread and if so It would be very appreciated. Don't say the word 'rare' - everyone will want to start collecting them! Apparently this is a quality crowd. I would like to believe this to be the case but? The Joan Of Paris duotone isn't bad though. Apart from the previously mentioned Cry Danger ( F. Cunninghame ), Joan Of Paris ( Marchant ) and The Fallen Sparrow ( ? ) 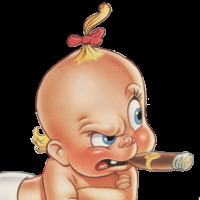 RKO duotones, I am now adding Five Came Back ( JNO Evans & Son ) and The Kid From Brooklyn ( ? ). This now makes a title of five, which still isn't many compared to the other major distributors duotone outputs. Joan Of Paris, The Fallen Sparrow and Five Came Back were printed in the 1940's and Cry Danger and The Kid From Brooklyn in the 1950's. If anybody has any other duotone RKO titles please post the images here on this thread. 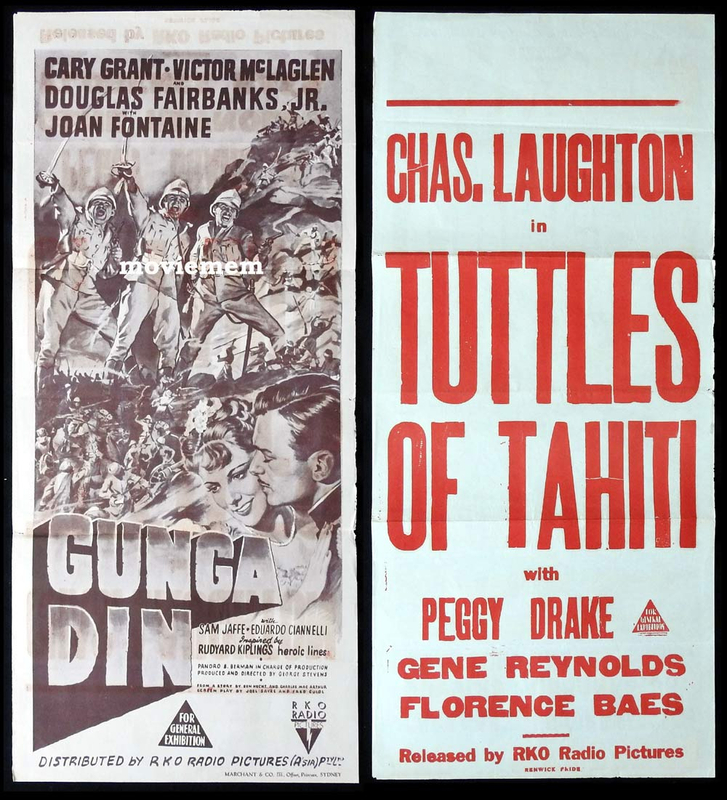 Gunga Din ( 1939 ) ( Marchant & Co. ) & Tuttles Of Tahiti ( 1942 ( Renwick Pride ) duotone daybills. I had the preceeding information sitting in my drafts folder for a while, but seeing John's posting on the Ghosting Poster Problems thread today of these two duotone RKO daybills being printed as a two sided poster, I decided to add them here. The question here is why did this occur? Fascinating stuff. Joan Of Paris ( 1942 ) duotone daybill which was previously displayed at the beginning of this thread and the original Simmons full colour first release daybill. This film was originally released in Australia in 1942. 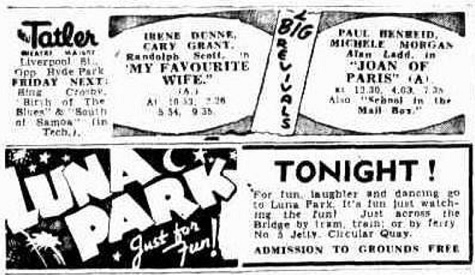 As per the Australian newspaper advertisements above the film was revived in Sydney commencing at the New Tatler on November 22 1946. 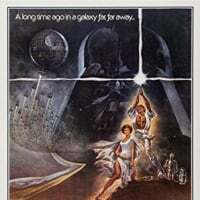 My thoughts are that seeing a film normally wouldn't have received an official re-release only four years after the original release, there would have had to have been a very good reason to revive it. 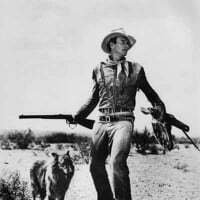 To me the reason for the revival had to be Alan Ladd. He was little known and had only a lesser role in Joan Of Paris in 1942, but by 1946 he had become a huge star. Alan Ladd's name in the 1946 ads was then added. An official re-release didn't seem to have happened in the U.S.A.. In 1942 Marchant & Co, the printer of the duotone version was only printing beautiful full colour daybill posters, but sometime in the mid 1940's they did a changeover to printing it appears only duotone daybills. This then would support the Joan Of Paris duotone printing being for the 1946 then later screenings. Cry Danger ( 1951 ). Original full colour 1951 Australian released daybill, a F. Cunninghame duotone daybill. 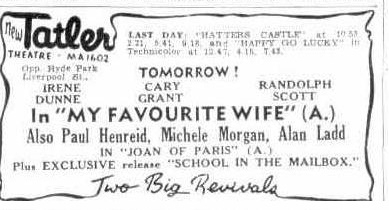 and a 1953 Australian newspaper clipping listing the film as a revival. What is interesting here to start with, is why was a duotone daybill produced in the first place? Cry Danger surely wouldn't have been a huge box office hit to have required another poster, if only a duotone, to have been designed and printed. As you can see earlier only seven different printed RKO duotones are available at present. My thoughts as to why the duotone wasn't needed is because of all the 1950's RKO printed daybills the Cry Danger original daybill appears to be the title with the most copies existing to this day. 26 daybills have been auctioned on emoviepooster,com to date, eBay has at least one for sale at present and I know of someone who has a good number in unused condition acquired from an MGM sale many years ago. So I suppose my question is why, with so many Cry Danger daybills surviving and with many in excellent condition, a duotone follow up version printed in the short span of time, being 1961-1958 when RKO ceased operating in Australia was required, when it would appear to me there was original stock still sitting in the vaults available? Now to try and date the duotone version the F. Cunninghame connection would suggest to me 1953 perhaps. It certainly though would be a second printing and not for an official re-release. Here is a question to think about regarding RKO daybills, Why are so many 1950's RKO original release daybills available in large numbers, e.g. Rancho Notorious,Texas Lady, Pearl Of The South Pacific, Tarzan And the Slave Girl and Passion and yet other titles such as Oklahoma!, Port Sinister, Wakamba!, Tarzan's Hidden Jungle, The Great Locomotive Chase and Westward Ho The Wagons!, to the best of my knowledge aren't available? Along with this I could name dozens of other titles where there appears to be one only copy sighted. Cry Danger, what a great lookin Daybill! Five Came Back ( 1939 ). This film was originally released in Australia in 1939 and a full colour long daybill printed by Simmons would have taken place then. The above duotone daybill in the 13'' x 30'' version, with the RKO 4 star logo printed on it appears to have been printed for 1942 screenings as per the 1942 newspaper advertisement above. The long style daybill ceased being produced at the end of 1941 and 1942 was the last year that the 4 star logo was printed on RKO daybills, although continuing on RKO one and 3 sheets until they ceased being printed in these formats as well and were discontinued by the end of 1948. Taking into account this information, 1942 would have to have been the year the duotone version was printed. The Fallen Sparrow ( 1943 ). This film was originally released in Australia in 1944 and a full colour full bleed daybill printed by Simmons of this title would have occurred then. This duotone daybill version is a second printing that would have taken placed sometime between 1944 and 1948, the year the ''Not suitable for general exhibition'' censorship rating was replaced by the new ''Not suitable for children'' wording rating. 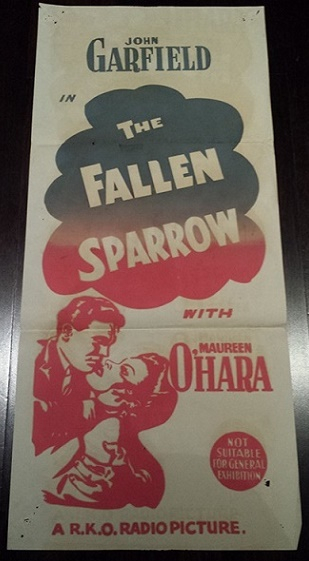 If anyone has an image of the original daybill of The Fallen Sparrow or a long daybill of the previously featured Five Came Back please let us see them here. 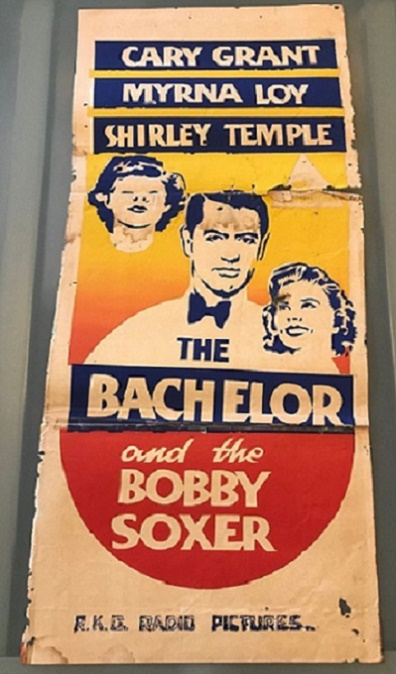 The Bachelor And The Bobby-Soxer ( 1947 ). Original 1947 first Australian release full bleed Simmond daybill and a possibly 1952 printed daybill version. Not a duotone but I thought that I would include it here, as it is rare and is limited in colour.